I did my first yeast starter last week. Yes, I’ve been brewing for 5 years. No, I’ve never done a yeast starter. I asked some friends, and ended up with a sweet resource on Billy’s site (this is the dude who runs the Homebrew Academy, which you should check out). I went to the homebrew shop, bought my ingredients, and made a yeast starter. I was all nervous at first.. How do I do this? What’s the next step. And then I realized it’s just like brewing, but faster. Like, 30 minutes all said and done. So this past weekend I made another one. And I bought a 2L erlenmeyer flask. And let me tell you, the batch I brewed yesterday was fermenting pretty vigorously this morning. Way more so than my batches usually are after only a few hours. Moral of the story, I’m learning more about yeast, and it’s fun. That is all. Glad the video helped you out. Starters are definitely the way to go. You can pay me back with some of those graham crackers in the background, served with beer of course. Hey, it’s never too late to start! For a while, I was under the impression that only high gravity beers needed starters – when in fact, any beer can benefit from a starter. I’m currently in the process of learning the science of washing/reusing yeast for future batches – especially with hard-to-access strains. Enjoying the blog and best of luck! I definitely want to get into reusing yeast. For the most part, I only use WLP001 (California) and WLP007 (Dry English). Let me know if you write anything about your learning process! Hey Gabe/PJ – What’s a good resource to learn about washing/resusing/storing yeast? Will do! My beers have all been across the board, so I’ve never gotten around to harvesting any specific type of yeast. I’ve yet to use PacMan, but as soon as I do, you can bet there’ll be multiple generations of that badboy in the fridge. It just makes more sense to harvest more yeast – Jamil’s yeast pitching calculator revealed to me a while ago that I’ve been historically underpitching my yeast – especially on my higher gravity beers. Watching Billy’s video reinvigorated my desire to actually save myself time and money. Awesome! I have still not made that jump yet, but I have been wanting to. It feels intimidating, but I guess it shouldn’t be. I will check out Billy’s video. I keep old yeast stocks in the freezer and this is the only way to go to get them back up to speed. One of these days I will buy a stirplate to get the most out of my starters. They definitely help your beer to take off. I took me about that same amount of time to finally use a yeast starter as well. I still don’t use them with any level of frequency but if I remember to do so, my beers usually turn out for the better. Get a copy of Chris White’s yeast book. It has taught me more than I ever thought I could know about those crazy little organisms. 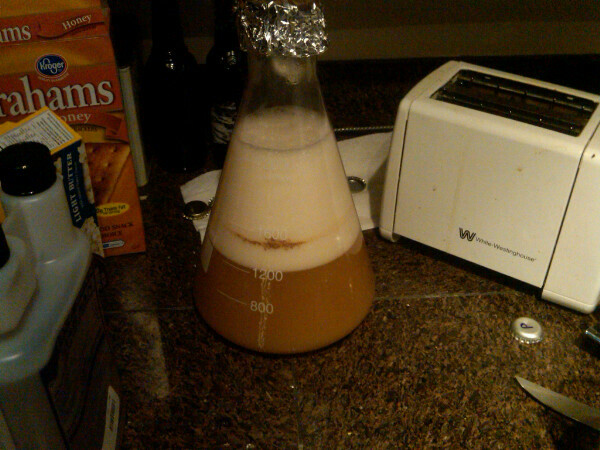 I have never done a yeast starter either. I haven’t had any real need for one.